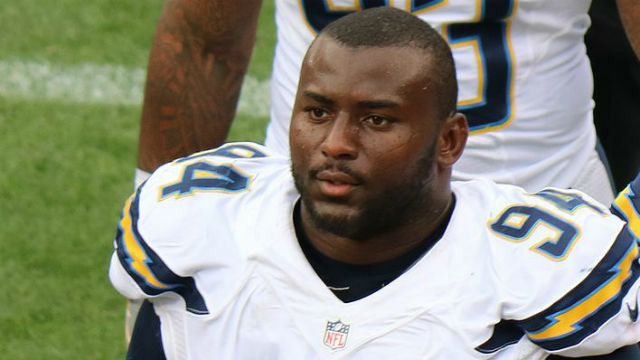 Los Angeles Chargers defensive tackle Corey Liuget was suspended Friday for the first four games of the 2018 regular season for violating the NFL policy on performance-enhancing substances. He apologized to his teammates, family and Charger fans. Earlier this month, Liuget made a $10,000 donation to the Marjory Stoneman Douglas High School football team to create a scholarship fund honoring a football coach killed in the massacre at the school in Parkland, Florida. The scholarship funded by the Coach Aaron Feis Scholarship Fund will go to a graduating member of the football team who exhibits characteristics representative of who Feis was and the traits he valued, Liuget said. Liuget, who was raised in Hialeah, FL, presented the donation to the team at Pine Trails Park in Parkland. He spoke to the team and joined players in a workout. Feis, an assistant football coach and security guard, was shot and killed as he shielded two students on Feb. 14.